Please be aware delays are possible with this unit as the demand for this product is extremely high. We apologise for the delay, thank you for your patience and will advise on a delivery date as best we can. Sentinel for air complete clean air welding helmet (0700000801). Comes with ESAB air unit (0700002301) with extended 1000mm hose. 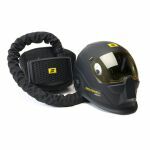 Delivery Includes: Sentinel A50 for air welding helmet, 4 x FREE outer lenses (2 x clear & 2 x amber), helmet bag. PAPR unit, 8hr Battery, Intelligent charger, P3 filter + Pre filter, waist belt & comfort pad, 1m hose and proban hose cover as image shows above. Halo™ Headgear. Ergonomic, infinitely-adjustable 5 point head gear provides extreme comfort and balance. Low-profile design, central pivot point allows for maximum head clearance while helmet is in the up position. Solar cell plus battery replaceable. (2*CR2450 lithium). Alerts when low battery.